January 26th | 2019. Gulf Coastal Catching Up | Peter M. Schloss | J.D. - Mediator. It has been a few days since I last “signed on”. We have enjoyed 4 wonderful days with long time friends, Hal and Jane Gilchrist on South Padre Island. The days and evenings were full of island fun, which is a mix of good food, good drink, elegant entertainment and just plain hanging out. Our travels are typically low stress, and SPI just made it even more so. On one excursion with Hal and Jane we drove to see the new SpaceX launch facility which is only a few miles by water from their condo, but about 45 minutes by car. The prior evening had seen the island and surrounding area buffeted by strong winds that gusted upward to 60mph. As we approached SpaceX I caught a news flash that the gale force winds had torn the top off of the “Hopper” Rocket. The “Hopper” is a scale model of the rocket that SpaceX envisions someday transporting a large contingent of colonists to Mars. It conjures up memories of the spaceships on the Flash Gordon programs that I watched zoom across my black and white television screen in the 1950’s. I have to believe the similarity is intentional as Elon Musk is first and foremost a promotional genius. The “Hopper” is designed to ascend to 16,000 feet and then vertically land at the SpaceX facility in California, demonstrating and perfecting the skills necessary for the Mars expeditions. Our visit with the Gilchrists at an end, we traveled northeast along the Texas Gulf Coast. We enjoyed 2 nights on the shores of Texana Lake near Edna Texas. The park is in alligator country, but we didn’t see any on our 5 mile hike through the swampland located within the park. Today brought us another 2 hours up the coast, nearing Galveston. Our leisurely drive was rewarded with the treat of camping on the hard-pack sands of the Brazoria County Free Beach. No electricity, no bathhouse, no showers, no drinking water… but priceless ambiance and the never ending sound of surf right outside the door of our camper. Did I say “priceless”?… yes, literally and figuratively since camping here is FREE! Setting up camp was a breeze as all we had to do was park along the dune that parallels the surf. Christine and I set off on a long walk down the beach and were attracted to the site of large multi-colored kites flying in the distance. 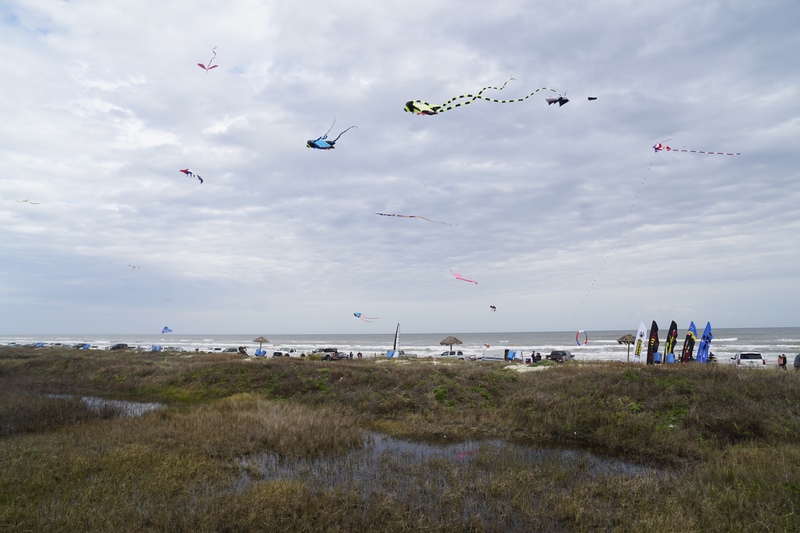 Continuing on we found that they were aloft at the site of the town of Surfside’s annual chili cook-off competition. There was free music, free beer, and a lot of really good (free!) chili! Free seems to be the theme of the day. Tomorrow we continue up the coast on old Texas Route 87, crossing the mouth of Galveston Bay by the Galveston-Port Bolivar Ferry. Of course, it’s free. We expect to make camp near Port Arthur, a stone’s throw from the Louisiana State line. Our destination for January 30th to February 2nd is “The Big Easy”, aka New Orleans. Thank you Charlene… and Hi to Chuck too! Did the guard at the rocket site look anything like Flash Gordon? I am enjoying you trip. Looking forward to your visit to the Big Easy. LOL! No, he looked a lot like security in a Walmart parking lot. The SpaceX facility was pretty underwhelming. It looks like you camped below high water line! I’d been worried about floating to Cuba or Cancun. I thought about rigging pontoons out of driftwood. Looks as if the weather is a little warmer now. Glad things are working out for you both. Have fun in New Orleans. As a matter of fact Steve and I are heading to New Orleans on our way to Florida to visit friends at the end of February into March.Stay safe! Thanks Pam!! Enjoy your trip. Enjoy your “Free–dom”–I’m sure Big Easy will not be free. You hit places at the most interesting times. I can see that you made more friends. Continue your journey in good health and safety. Thanks Mom. Stay warm and don’t drive if there is snow on the road! I watched Flash Gordon on Community Space Theater on WGN Channel 9 when I was a kid. It was a staple every Saturday morning. The sponsors included MagicKissed Carpet Cleaning and Earl Scheib’s $29.95 car paint job. Flash Gordon’s nemesis was Ming the Merciless, Emperor of the Universe with his capital city on the Planet Mongo. His city floated above the planets surface, supported by Z Rays. He did this to keep out undocumented aliens.